The ocean has no paved roads, no street signs, and does not give away the shapes of the ground beneath its surface. Successfully navigating a boat is therefore a much more sophisticated effort than driving a car from point A to point B. Various electronic devices, such as GPS and sonars, can offer guidance in this respect but boaters often learn that it is unwise to rely entirely on devices which may be destroyed or damaged by water. Charts, which have been standardized for easier use, are reliable and useful means of navigation that should be understood by any boater. They are available for every coastal region, often in different sizes and levels of detail, and contain a wealth of information that will make navigation easier and boating safer. Despite their standardization, charts use specialized information, specific to ocean travel, and so many aspects must be learned before they can be used to their full potential. Below is a guide that will teach you how to read a nautical chart. Charts generally have a table of information that is specific to each, which should, in addition to this guide, be studied with care before use. At first glance, a nautical chart may seem confusing and difficult to read, especially because of its difference from an ordinary map. Once you are able to understand all of its features, however, the chart will become one of your most trusted aides on the boat. First, we will take a look at the basics; namely, the three different colors that take up most of a chart’s area. The beige or tan color, as you may have guessed, indicates land masses. On land, lighthouses are indicated by a dot, which shows the exact location of the light, with a teardrop shape next to it. An example is circled on the chart in yellow. The letters next to it tell information about the lighthouse. This one is marked with FL, which indicates that is a flashing light which flashes every four seconds. The second row, 22ft 7M, means that the light is 22 feet tall and may be seen from seven miles away. Also marked on land, as you can see in this chart, will be locations of water-crossing bridges and their horizontal and vertical clearances, especially if they are fixed and will not draw up or rotate to allow taller boats through. As for the part of the chart that deals with the ocean, white indicates deep water, while light blue indicates shoals or shallow water where you should take extra care navigating your boat, taking depth soundings as you go. The numbers that you see in both the light blue and white areas indicate depth, which is generally measured at the lowest tide of the cycle. Some older charts may have soundings taken at mean low water, so check the information on the chart before you use it. Regardless, it is a good idea to take your own soundings and not entirely trust these numbers – the ocean floor does not remain the same, so depths can and do change, and tides may be lower or higher than usual for various meteorological reasons. The dotted line, circled in purple, is often used to surround very shallow areas and submerged obstructions such as rock spires. It can also be used to indicate the shoreline at low tide if it is drastically different from the same line at high tide. A different kind of underwater obstruction is circled on the chart in dark blue – this symbol indicates a sunken ship. One of the most critical aspects of navigation is undertaken when approaching harbors or coves, where the water becomes shallow and more treacherous. Most harbors have channels to guide boats into their mooring or anchorage, which are delineated by buoys and other navigational aids. There are many different types of channel markers, with increasingly complex meanings, so we will start at the very beginning with the channel markers you will see most often. Look at the symbols circled in blue on the chart. These diamond-shaped markers indicate green cans (in green or black) and red nuns (in red or purple). Green cans, as their name suggests, are green can-shaped buoys with their number painted in white. Red nuns are triangular in shape, painted red with numbers in white. Numbers on green cans are always odd and on red nuns always even. On a chart, the cans and nuns will have their number below them. 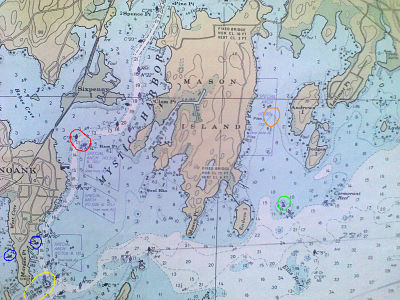 On this particular chart, the small circles at the base of the can and nun markers are blank; if you see them filled in, it means that they are lighted buoys. An excellent rule for channel navigation is contained in the phrase Red Right Returning – when you are coming into a channel from the sea, keep the red nuns to your starboard (right) side. The triangular mark, circled in green, is called a “daymark” or “daybeacon” – a navigational aid meant for high visibility in daytime. The triangle means that it is red; green daymarks are denoted by squares. As with the channel markers, the red and green indicate that when returning from the sea, red should generally be to starboard and green to port. Now that you know the basics of nautical chart use, one more very important tip to keep in mind is that compass roses on charts indicate magnetic north, not true north, so be careful how you use your compass! Charts should be a permanent fixture on your boat; keep them in protective sleeves if you are worried about moisture or other damage. Waterproof charts are also available. If you wish to learn and memorize all abbreviations, the U.S. government publishes a guide called Chart No. 1. Make sure to check regularly for updated charts or information – you may wish to either buy new charts or to update your old ones by hand if the changes are not too drastic. Using a chart gives you greater seafaring knowledge and therefore greater freedom, so enjoy!